Hajdúszoboszló is the most well known bath-city of the Hungarian Great Plain – its main attraction its bathing complex with its famous spa, open-air bath, Aquapark and the Aqua-Palace. The bathing complex offers unforgettable adventures throughout the year to its recuperating and recreating guests and to families of any size. This famous spa of great traditions became a national recuperation centre thanks to its thermal water and its numerous world class health services. Open from May till late autumn. This 30 hectare bath offers unique experiences with its Mediterranean sea side and its 13 pools including the pools called Wave, Bubble, Children, Training and Omega. The Aquapark is a real chute paradise. Its offer includes the chutes called: Huge, Hydro, Multichute, Kamikaze, Black Hole, Crazy River, Big Hole, Twister and Niagara. Aqua-Palace awaits those wishing to rest with covered thematic pools, chutes, child friendly services and with a wide variety of programs, in the winter as well. Hunguest Hotel BékeFinnish and infra sauna, aroma steam bath, naturist version too. Would you like to get a wellness treatment? Would you like to take a holiday with you family? Covered spot, Highlighted events, Culture, MusicSpring Art Days in Hajdúszoboszló5. March-11. April 2019. Food Festival of Hajdúság3.-5. May 2019. Grilled food & Beer Festival in Hajdúszoboszló7.-9. June 2019. Szoboszlói Dixieland Days1.-4. August 2019. Organic Food and Wine Festival13.-15. September 2019. Szoboszló Grape Harvest Festival18.-20. October 2019. 14. November 2016Hajdúszoboszló a superb resort for pensionersWhy is Hajdúszoboszló a superb resort for pensioners? We will let you know. 8. November 2016Hajdúszoboszló medical treatments for a healthier lifeIn the autumn-winter period, Hajdúszoboszló is the paradise of those wishing to heal and refresh, where taking a bath in the beneficial medicinal water, combined with the medicinal and wellness treatments help to find the harmony of your body and soul. 8. November 2016The most beautiful souvenir from SzoboszlóAt the beginning of the 1950’s, the ancient tradition of black ceramics was revived, for which visitors come to the city even from abroad. 7. November 2016The way of tavernsGet to know the best taverns near Hajdúszoboszló! 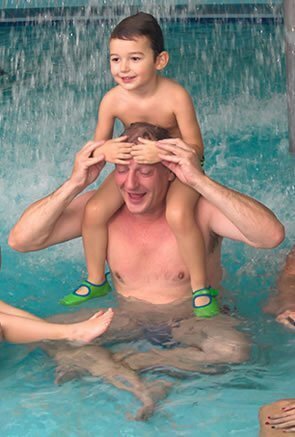 We love Szoboszló, because although the Beach, the Aqua Park and Aqua-Palace experience bath offers a lot of programs, it is still an extremely family-friendly place. I know that it is a bit cliched, but really, if I am on holiday in Hajdúszoboszló, there is nothing I wish but cannot get. I owe one of the most beautiful moments of my life to Hajdúszoboszló, as my husband asked to marry me at the end of a wonderful holiday.